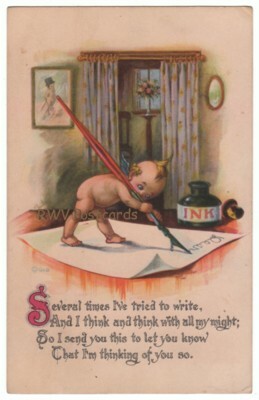 Kewpie Postcard: Did you know…? 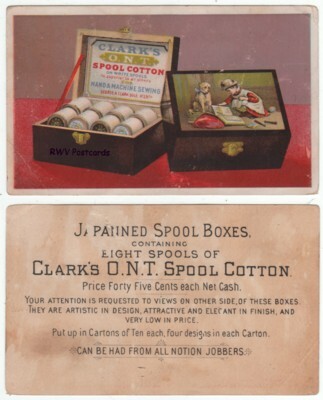 Postcard collectors may be familiar with Rose O’Neill’s Kewpie doll-like illustration created in 1909. A Kewpie is a comical character with a somewhat larger head, big eyes, cubby and rosy cheeks, and a curl or top knot on top of it’s head. I found out some trivia about the Kewpie I wasn’t familiar with I thought I’d share with my readers. The Kewpie was the first case of merchandising based on a comic character. The 1939 New York World’s Fair time capsule contained a Kewpie doll. The Kewpie doll was mentioned in Anne Frank’s diary, and John Steinbeck’s 1930s novel, Of Mice and Men. The Kewpie is the mascot of the Kewpee Hamburgers chain. 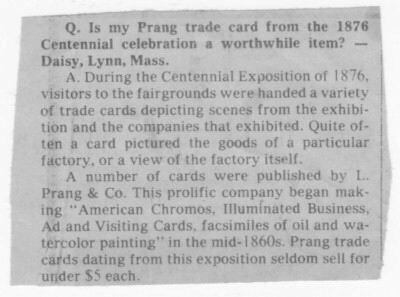 I find trivia always fun and interesting; especially if connected to old vintage postcards. I hope you found the above trivia fun and interesting too. Vintage Postcard of Union Station, St. Joseph, MO published by St. Joseph Calendar and Novelty Co.
I’ve always found it fascinating to find out what famous person visited or slept at a place I’ve visited; kind of a twice removed celebrity status type thing. In this case, the place is Missouri. I was driving a brand new K car my Dad bought there for Mom, back to Wisconsin. I’d just gotten my driver’s license, so it was a big deal for me. Mom followed in the old car. 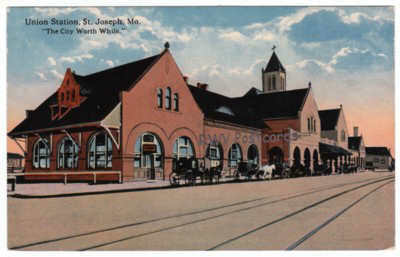 The pictured old vintage postcard is of the Union Station in St. Joseph, MO. The first railroad station (depot) there was built-in 1882, which boasted a hotel on the 2nd floor and horse-drawn taxis (courtesy of the hotel) in front. It was considered a local attraction. Sadly, the first railroad union station burned in 1895. The second depot, built-in 1896, was just as grand. It boasted a dining room, a barbershop and a shoe shine parlor within it’s high arched ceilings, but no hotel. Where did visiting celebrities and politicians sleep? I don’t know about Buffalo Bill Cody (who visited once), but former heavyweight boxing champion Joe Louis slept in a private car there. Presidents William Howard Taft, Dwight Eisenhower and Woodrow Wilson also visited the second St. Joseph, MO railroad station. President Woodrow Wilson’s visited in 1919, a couple months before suffering a stroke that made him an invalid for the rest of his life. The second Union Station in St. Joseph, MO was demolished in 1960, victim of the increasing popularity of automobile travel. Be sure to stop by The Best Hearts Are Crunchy for Postcard Friendship Friday. The Postcard’s Pudding Is on Fire! 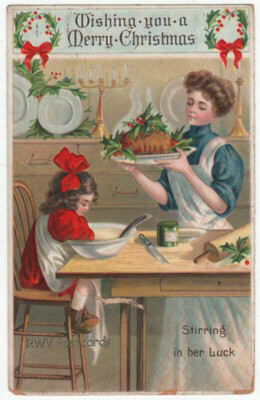 The mother on this antique postcard is making the traditional dessert served on Christmas Day, Christmas Pudding or Plum Pudding. It is a dark, steamed pudding, with sweet spices, dried fruit and nuts, and usually made with suet that originated in England. This pudding is definitely not for those on a diet. Christmas Pudding can be traced back to the 1420s. Back then, it was not a confection or dessert, but a way to preserve meat (dried fruits acted as the preservative). I wonder how long this preservation method lasted. The ancestor of the modern pudding was the pottage, a meat and vegetable concoction. During Queen Elizabeth 1’s reign, plums were added (a popular ingredient). As the sweet content of the Plum Pottage increased, it became increasingly known as Plum Pudding. Around the 1830’s, it became more and more linked with Christmas. Traditionally, Plum Puddings were made four to five weeks prior to Christmas (usually the last Sunday before Advent) as they needed to age in the traditional pudding cloth. 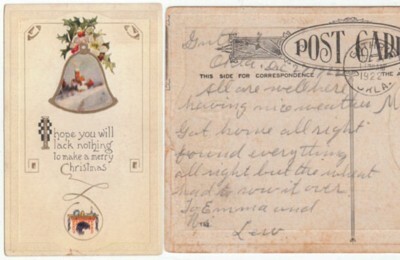 The household members (at least the children, see pictured antique postcard) took turns making a wish while stirring the concoction. This is why the day became known as Stir-up Sunday. Tokens (initially a silver coin) were included in the pudding. Whomever’s serving included it, kept the token. The Christmas Pudding is ceremoniously brought to the table after being doused in brandy and flamed. It was greeted with applause. The Plum Pudding was originally eaten at the Harvest Festival, not Christmas. ** If you liked this blog post, click on the bookmark button to the right.